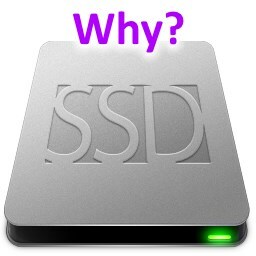 SSD stands for Solid State Drive/Disk. It’s a hard drive. Normal hard drives (HDD) have spinning metal disks inside them, with a read/write head on an arm that swings back and forth over the disk(s). They read and write data using magnetism, and they work sort of like a record player. A normal HDD can store a lot more data, often 1 or more TB (terabytes) nowadays. That sounds good, and for the most part it is. But normal HDDs have one big limitation: the data transfer rate. HDDs can transfer data to and from your puter at somewhere around 50-100MB per second. If you use certain benchmarks, they will tell you that your mechanical HDD is reading/writing at maybe 120MB/s. But, if you really look into things deeply, you’ll quickly realize that in day-to-day use, you’re probably getting a real-world transfer rate closer to 50MB/s. Now, let’s think about this… Data moves in and out of your processor at many GB/s (1 GB = 1000 MB). Data moves over the PCI-e bus (like between your graphics card/chip and the rest of the puter) at many GB/s. Your RAM also runs at many GB/s. And then, there’s your little mechanical HDD, chugging away at 50MB/s… 100MB/s if you’re really lucky. This means that your HDD’s data transfer rate is usually well over 100 times SLOWER than the rest of the parts in your puter. This is what we call a “bottleneck”. It doesn’t matter how fast your processor is – if your HDD is slower than molasses, Windows will still take 300 years to load because your trusty old HDD is just too dang slow. 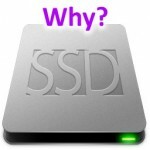 SSDs today have transfer rates around 500MB/s and up. As with a normal HDD, there is a difference between benchmark results and real-world results, but that gap is much smaller. On average, you can expect the data transfer rate of an SSD to be at least 5 times faster than your mechanical HDD. SSDs are faster because they have no moving parts, and they store data in fast flash memory. These memory chips are similar to the kind of flash in your MP3 player, USB stick, and smartphone – only manufacturers use a different type of flash memory plus some fancy tricks so that the data transfer rates – and reliability – are much higher. 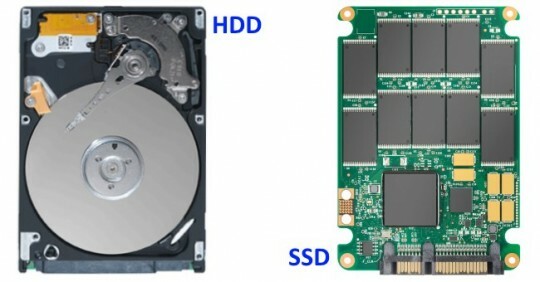 As you might expect, there is a trade-off that comes with SSDs: they are much faster than HDDs, but they are usually much smaller in total storage size. For example, a mainstream SSD these days is 120 GB or 250 GB, and costs around $129 for the 250 GB flavor. 1 TB is 1000 GB. So, if you have lots of data on your puter, you can’t fit everything on the SSD. Thus, you must change things around: Instead of having 1 large and slow HDD with your OS and data, you need 1 SSD with the OS and key files, and 1 HDD for storing all your data plus some larger programs. In this way, your OS like Windows is running on the very fast SSD, and many of your programs are running off the SSD. This makes everything a LOT faster. Your boot time, for example, will drop dramatically. Windows will load much faster. Programs will load much faster. Your data files which don’t have to be loaded so often (or so quickly) are stored on the old slower HDD, but they too will seem to load faster since the programs that access those files will be running on the SSD. So, the #1 upgrade you can make to your computer today is the addition of an SSD. How to perform an SSD upgrade is the topic of my next post. Stay tuned!